ScreenshotKim Yo Jong, North Korean leader Kim Jong Un’s sister, stands behind the US Vice President Mike Pence. Kim Yo Jong, the sister of the North Korean leader Kim Jong Un, made some highly anticipated, heavily publicized appearances during the Olympic opening ceremonies in Pyeongchang. 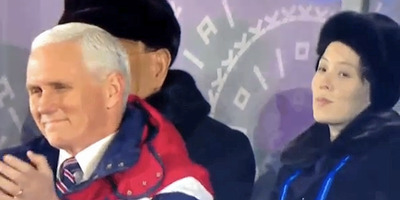 But one video from an Olympic event that surfaced on social media shortly before noon local time showed a particularly striking visual: a clapping, smiling US Vice President Mike Pence, with a decidedly muted Kim Yo Jong, standing behind him, and throwing a look to the camera. Much ado was made about the close physical proximity between Pence and his wife, Karen, and Kim Yo Jong, though the three never publicly spoke. Before travelling to the region earlier this week, Pence said the goal was to bolster ties with South Korean and Japanese leaders while isolating the North. It was evident from the multiple pictures emerging from the event that Pence indeed made no discernible effort to acknowledge or engage with the North Korean delegation. But the move seemed to fall flat, as The Japan Times tells it.